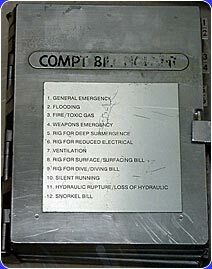 Bills are checklists outlining proper procedures for most submarine activities and operations. They are bound into notebooks and conspicuously mounted in all of the boat's compartments for quick and easy reference. If a flooding alarm is sounded, for example, a crewman reaches for the damage control bill, which will outline the steps necessary to deal with the emergency in that particular area of the boat.